And Pierre-Emerick Aubameyang, who'd been anonymous to poor up until that point, made no mistake with the resulting 12-yard strike. His strike partner Alexandre Lacazette, who had outperformed him in every facet save for the scoresheet, finally joined him there on the 83rd minute to secure the points, though Nathaniel Mendez-Laing's late score put that momentarily in doubt. Though they could've had four or five by the end, it would've been interesting to see how Arsenal would've fared had Manga not brought down Kolasinac. The goal naturally eased the Gunners, finally allowing them to play some actual football after 60 minutes of anything but. 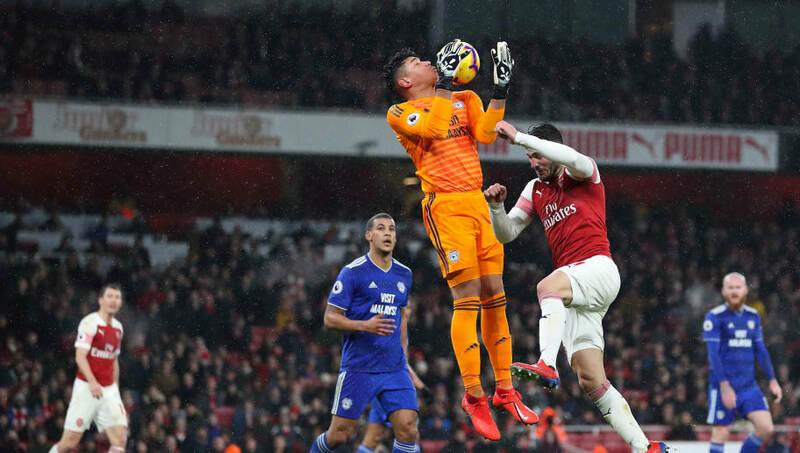 In the end, of course, it was all about the points, and Cardiff are certainly one of the more resolute outfits out there, but Unai Emery will surely be concerned by his side's inefficiencies for a large part of this game. Torreira (7), El Nenny (4), Guendouzi (8); Ozil (5); Aubameyang (6) Lacazette (8*). Substitutes: Iwobi (7), Jenkinson (6), Ramsey (6). STAR MAN - It was another admirable feather in Matteo Guendouzi's burgeoning cap, and Alex Iwobi provided some much needed impetus when he came on, but ​Alexandre Lacazette was his side's most willing runner, and always looked the likeliest to settle the game. When he finally did, it was well deserved. WORST PLAYER - If you were going by the first half, this would be as competitive field as you're likely to get this season. But the second period thankfully narrowed down the list of nominees. Mesut Ozil definitely wasn't great, but he wasn't as bad as his hoard of haters are no doubt suggesting. So, I'll go for Stephan Lichtsteiner, because his boss certainly seemed to think so when he took him off before the 60th minute. Brought in to be a figurehead in the dressing room, he looks like a weirder signing with every game. As with so many games this season, it was a case of what could've been for Cardiff. In the circumstances, the away side were impeccable in that first half, as they thoroughly outplayed their hosts. But, once again, their inaccuracy up front cost them. A fact that, on this night of all nights, was particularly poignant. Paterson(6), Arter(5), Gunnarsson (6), Ralls (5); Reid (7*); Niasse (5). Substitutes: Mendez-Laing (7), Zohore (6), Harris (5). STAR MAN - Neil Etheridge was typically resolute when called upon, although you were almost disappointed when he didn't save the penalty, such is his record. But I'll give it to Bobby Reid. Time and again he made excellent runs into the Arsenal penalty area, and time and again one of his teammates chose the wrong option by backing themselves. Needless to say, the ball boys were kept busy with plenty of trips into the stands. While Reid wasn't immune from such imprecision, he was still his side's most dangerous player. WORST PLAYER - Bruno Ecuele Manga could've given away three penalties on another night. On this one, it was just the one, but it was no less costly. Just like Shkhodran Mustafi, he just seems unable to keep himself from incessantly and unnecessarily diving in. ​Arsenal will face one of the sternest tests of their season this weekend, as they travel to the Etihad to face Manchester City on Sunday afternoon. Meanwhile, the important clashes for ​Cardiff don't let up, with the hosting of Bournemouth on Saturday followed by a crucial trip to Southampton.